Mechanical engineer by academics and a Software Engineer by profession. Right from childhood I had a passion for machines and exploring places in India by road. By road I do not mean by car or by bus but on a Motorbike. Why on a motorbike and not car or bus? Well, I guess it was in my blood. With the means to travel ready it was time to start quenching my thirst to explore different places. In the past few years I have ridden to many places within Maharshtra, Gujarat, Ooty, Delhi and Ladakh. Each ride had been a learning experience and has its own special memories. But the first ride is and will always be the most memorable. My first Ride on my THUNDERBIRD had been with two unknown people Prashant and Avinash, both software professionals, sharing the same passion. We met online through the company’s (RE) online forum and were in touch through mails and finally in June we decided to do our very first ride to the Sula Winery at Nashik and Bhandardara. Wear proper riding gear Full face helmet, Full sleeved jacket, Full trousers/Jeans and Shoes. Basics of Group riding, Hand signaling. Riding together in a pack and not leaving anyone behind. After this first ride I was caught up with work and could not do much rides. 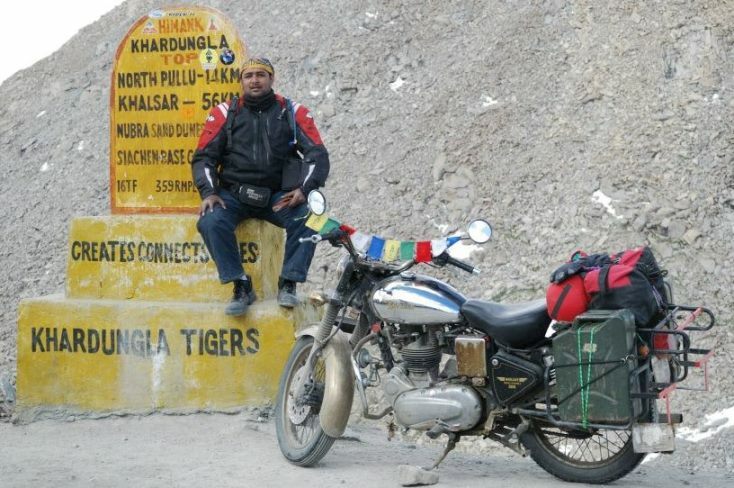 By then Prashant and Avinash had joined ‘INDDIETHUMPERS’, the Bullet club of Mumbai, which comprises members who have a passion for their Bullets (Bike) and love to travel on them. They were doing rides with the club with 30 plus riders at a time and following the learning’s of our first ride. Finally in December 2006 I could take time off and joined the club just prior to the big ride of the year ‘Rider Mania (RM)’. RM is the annual meet of all the Bullet riders of the different Bullet Clubs spread across India. The entire bullet fraternity ride down to the Venue and the number reaches above 500 people. Guess what the RM 2007 was to be hosted in Nagpur (my hometown) by the Nagpur bullet club ‘WANDERLUST’. So my second ride (and first with the club) after a gap of 6 months was to be the biggest event of the year of the Riding Community with new learning’s and 50 people riding together but that is a different story to tell some other time. 30th April is an important day in my life, I got my first RE bike on that day and 3 years later got married on the same day. This is Vikram Tandale (Inddiethumper) signing off.